China continues – rigorously and relentlessly – to develop true blue-water naval capabilities, complete with carrier-borne aviation assets. Now Andreas Rupprecht admirably augments Harpia's 2012 Modern Chinese Warplanes and recent Flashpoint China with a solid survey of "Chinese Naval Aviation - Aircraft and Units". Chinese maritime forces will, Rupprecht opines, "probably be the largest beneficiaries of the recent [military] reform and modernization". And he dutifully and methodically charts the latest "Naval Aviation" ("NA") research, production, procurement, service, organization, and weapons developments. Surprises naturally abound. Don't skip Rupprecht's revelations on Chinese serial numbers. And did you know that Naval Aviation "retired its hopelessly obsolete J-6s" – Chinese-built version of the Soviet MiG-19 – "only in 2006"? Reproducing several photos in small sizes made viewing difficult. Subject references with no companion illustrations sent me scurrying to other sources. And noting original designations of Chinese types derived from foreign designs would clarify comments. Additionally, where is that 2012 source by "Andrew S. Erikson" in the author's selected bibliography? And why no shots of Soaring Dragon UAV concepts – especially since they have "no equivalent in the West"? None of these criticisms irreparably diminishes Rupprecht's solid study. Harpia has forged robust repute for splendid surveys of global militaries. 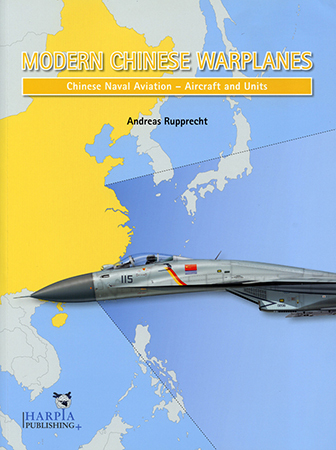 Illumine the ascendancy of Chinese naval air power with this vital handbook. And hope for a similar update on the PLAAF.